Embark on a sightseeing tour of this bustling city. Along the way, you will see the Galle Face Green promenade, Dutch Hospital precinct, Fort Railway Station, a Hindu Kovil, Beira Lake, and Independence Square. This afternoon, drive to the ancient city of Sigiriya. Today, visit the famous SIGIRIYA ROCK FORTRESS, a giant magma plug which has served both as a long-standing Buddhist monastery and a fortress. Surrounded by a network of gardens and moats, it is a geological and anthropological landmark. The ancient ruins of the upper palace built by King Kasyapa can also be found on the summit, which, at 656 feet above sea level, affords magnificent views across the beautiful Sri Lankan countryside. On the way to the top, you will see the famous Cloud Maidens frescoes painted on the rock wall. Later, visit the UNESCO World Heritage-listed ruins of POLONNARUWA. This morning, visit the fascinating DAMBULLA ROCK CAVE TEMPLE, containing well-preserved frescoes and statues of Buddha. Next, drive to the city of Kandy, a jumble of culture, history, and colonial buildings. Visit the TEMPLE OF THE TOOTH and enjoy a comprehensive tour of this green city, taking in the colorful KANDY MARKET and the Upper Lake Drive. Begin today with a visit to the PERADENIYA BOTANIC GARDENS, which are renowned for their collection of orchids, spices, and medicinal plants. Then, journey through forests to the misty hills of Nuwara Eliya, also known as “Little England.” Set high above sea level and surrounded by rolling hills, its cool temperatures, humidity, and rainfall provide the perfect climate for tea production. Visit a TEA FACTORY en route and be enlightened on the tea manufacturing process. Depart Nuwara Eliya and view the famous RAVANA FALLS before continuing to Tissamaharama. Today, enjoy MORNING & AFTERNOON GAME DRIVES in YALA NATIONAL PARK by jeep. The park is home to one of the highest densities of leopards in the world, with sightings of these beautiful creatures not uncommon. Yala is also a bird-watcher’s paradise, with around 230 species recorded in the park. Also, you may spot elephants, sloth bears, water buffalo, macaques, and mugger crocodiles. Rise early and travel to Mirissa, where you board your WHALE-WATCHING BOAT in search of sea life. The harbor is home to many different marine animals, including dolphins, flying fish, orcas, turtles, and manta rays. Be sure to keep an eye out for the largest creature on Earth, the blue whale. Return to your hotel this afternoon and enjoy the rest of the day at leisure. Travel to Galle, where the natural harbor offers gorgeous views of the ocean. Enjoy an orientation tour of the city, and visit GALLE FORT, a UNESCO World Heritage Site. 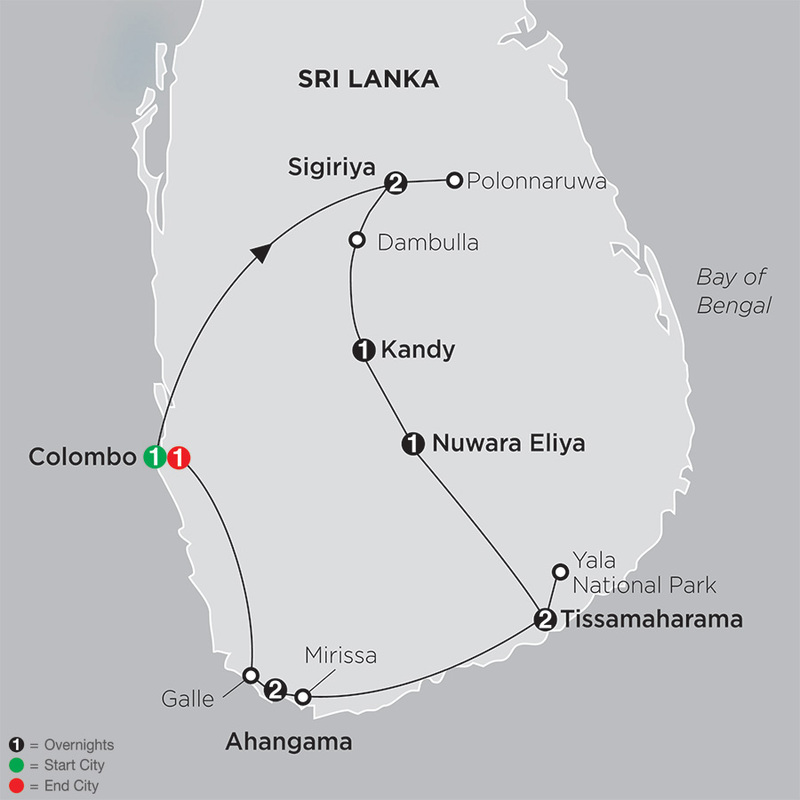 This afternoon, continue to Colombo for an overnight stay.